This paper discusses floating water bridges as Birkeland currents. The hypothesis presented in this paper is that the apparently anomalous behaviour of partially-ionized liquids can be understood by applying the principles of ionized-gas plasma to the charged particles in the liquid. Yes, I had a look at that paper some time ago. Very compelling comparison with regard to the development of apparent field-aligned currents in partial ionized diamagnetic fluids such as water. Of course, it's not fully the same as a plasma environment in terms of various phenomena and particle arrangement - but the stability of the filament and the rotating annulus structure is fascinating. 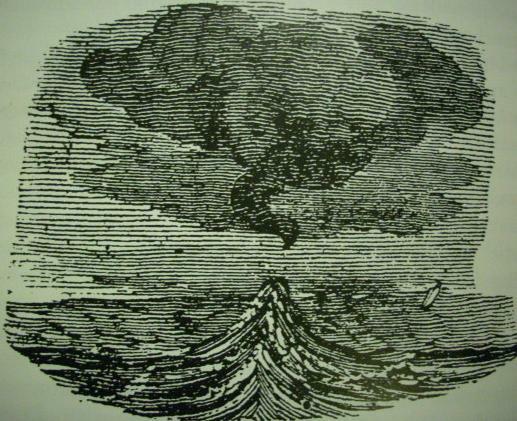 There is good reason to suppose that field-aligned currents occur in our troposphere and lower atmosphere rather than simply in the ionosphere. I saw this amazing video of a recent waterspout. Could electrical activity in the atmosphere help explain them? might also be satisfied by the same experiment as seen in the following video. Coronal Mass Ejections are ejected from the sun in the form of spinning masses of ions of H and O and electrons (and other ions, He, C, N, Fe, etc.). Some of the mass ejected is clumps of varying density, held together by mutual charges. The CME clumps swirl amid the solar wind and some impinge upon and become confined in earth’s magnetic and gravity fields. Portions of a CME agglomerate in higher density units and maintain unity as they enter into earth’s flux fields in the form of discrete cells of rotating EM charged ions of H and O, (etc. ), and, subsequent to being caught in the earths magnetic and gravitational influences, the mass cools in the planet’s shadow and H and O associate into H2O while still retaining the inertial rotation component of the original CME clump, as well as reacting with the rotational influences of the EM environment of the planet. The mass, some of which is now agglomerated into water, becomes gravitationally influenced and falls toward the planet. As the gravity’s influence increases density by compression of the H, O, OH and H2O, the inertial rotation is conserved and the rotation rate increases like a skater pulling in the arms increases the rate of rotation of a spin. The increased density of mass combined with higher rotational velocity results in subsequent concentration of associated EM components. 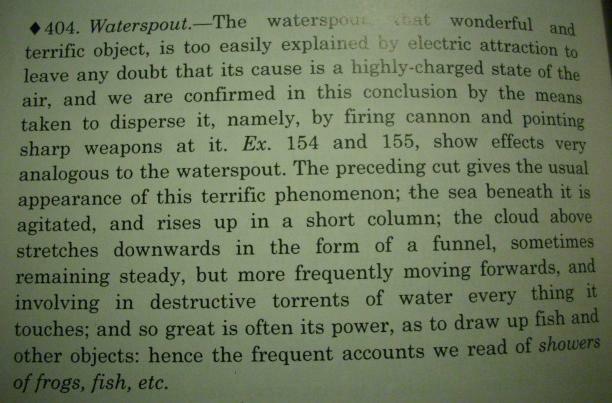 The result is a concentration of higher voltage, amperage and water (ice) and mass with rotational energy, ergo, a thunderstorm or tornado, the size and power of which depends upon the amount of charged mass (H, O, OH & H2O) in the initial contiguous clump of CME that was the precursor. The Solar Wind in general continually supplies solar mass to the local magnetic and gravitational field of a planet, but a CME and associated density brings larger incidental mass and energy influxes. Co-author Melvyn Goldstein, also from Goddard, said: "The solar wind can enter the magnetosphere at different locations and under different magnetic field conditions that we hadn't known about before. That suggests there is a 'sieve-like' property of the magnetopause in allowing the solar wind to continuously flow into the magnetosphere. So what's the explanation for tornados at night? Is this where the water comes from, at least part of it? But we haven't found any large amounts of water on other planets? ElecGeekMom wrote: Is this where the water comes from, at least part of it? I think so. Some of it also must come from beyond Earth’s orbit and the outer regions of the solar system where the H and O coagulate into cometary bodies which then fall back toward the Sun. Our fortune is to exist in circumstances and an orbit where the pressure and temperature is favorable for the existence of water in all three phases, vapor, liquid and solid. 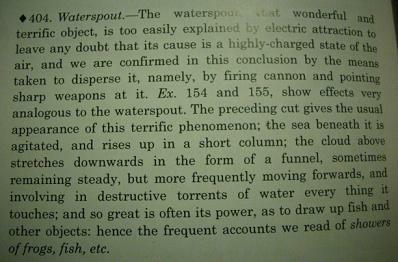 Twenty to forty tons of water enters the atmosphere every three seconds in the form of “water comets” described here. Water is there but the conditions of pressure and temperature are such that water can only exist as a vapor or solid, like the water on the Moon and Mars. It appears You believe in icy comets. Correct me if i'm wrong but You seem to imply the body of the comet is ice. If this is Your position it has nothing to do with EU. Please don't be so quick to dismiss the "icy comets." There is indeed an icy trail of ice "asteroids" (mislabeled "comets") traveling the same orbit as Earth. These blocks of ice move faster than the Earth within the Earth's same orbit, (but not at the much faster speed of actual comets), the motion is termed "prograde motion." Every day, tons of ice enter the atmosphere. This "space ice" is responsible for most noctilucent clouds, in spite of the dearth of information about the ice and the clouds. On the other hand, water vapor is ionized in the upper atmosphere, and the hydrogen portion escapes into space. This continuously depletes the Earth's atmosphere of water. It is the fortunate state of Earth's affairs that these icy blocks continuously enter the atmosphere and replace the lost water. An article was published during the 1970's or '80's in Scientific American concerning research on this same subject. The article had pictures of these holes punched by the ice, taken from high flying research planes, and their connection with noctilucent clouds. I can't find the article, naturally, at this time. These fellows, the authors of the web site, are well versed in plasma physics. The physicists' links that Maol posted discuss the lack of scientific inquisitive drive of the consensus scientific community. The authors' work has never been refuted, just sidelined and buried. As You know, i'm an idiot. On the other hand, Wal Thornhill isn't an idiot. I'd like to know Wal's opinion of icy/watery comets or asteroids. Everyone knows comets are made from ice. From what i can tell, everyone is wrong. Except for surface ice, which is far different than icy/watery comets and asteroids. starbiter wrote: I'd like to know Wal's opinion of icy/watery comets or asteroids. then emit ultraviolet light, invisible to the naked eye. that they haven't seen anything of these impactors. preferentially along the ionized trail created by a meteor. Yeah, on second thought, ice sublimes in a vacuum. That fact alone precludes icy anything in space. Still , I would like to find the Scientific American article, just for giggles. Goldminer wrote: Yeah, on second thought, ice sublimes in a vacuum. That fact alone precludes icy anything in space. Still , I would like to find the Scientific American article, just for giggles. It's always refreshing to read what Wal has to say. To me Wal is clear and logical. We're so lucky to has access to his thoughts. And it's free.